Usain Bolt is a three-time Olympic gold medalist. He holds the world record for the 100 meter, the 200 meter and, along with his teammates, the 4x100 meter relay. He also holds the Olympic record for all three of these races. At the 2008 Summer Olympics, Bolt became the first man to win three sprinting events at a single Olympics since Carl Lewis in 1984, and the first man to set world records in all three at a single Olympics. In 2009 he became the first man to hold the 100 and 200 m world and Olympic titles at the same time. PUMA v1.10 SL Lightning Soccer Shoes! 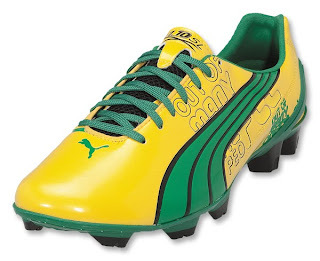 In honor of Usain Bolt's other-worldly speed, and his love for soccer, PUMA has designed a special edition v1.10. The SL Lightning is inspired by and set up like a track shoe, which is perfect for a track star like Bolt. If your game is designed around speed, you need the boot designed for the fastest man ever. PUMA's v1.10 weighs just 5.3 ounces and with that number PUMA redefines our expectations of soccer boots and how much they should weigh. The Upper has "out of many people" design and embossing. The sole is composed of one piece of metallic green pebax with a carbon fiber inset to minimize weight and increase stability. A PUMA AptoLast mimics the shape of the foot. Bonus - there are three faux diamonds on the PUMA cat's tail.